How did you come up with your costume idea? I love dressing up my horse for Halloween, and I like it to be a challenge. 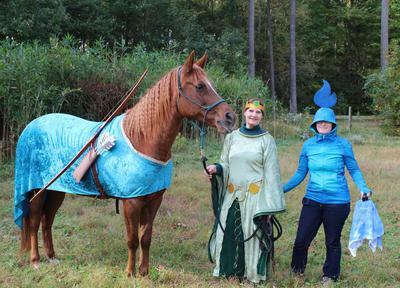 This year my mom asked me to create a trio costume for the two of us and the horse she is leasing Sunshine. Since Sunshine is a beautiful chestnut mare, I wanted the costume to look good on her and play on the fact she is a redhead. My love of Disney and the wooden longbow I found at my grandfather's house definitely provided some inspiration. I gave my mom a list of some costume ideas and she really liked the Brave trio. So we decided to do Sunshine as Merida, my mom as Queen Elinor, and myself as a Will o the Wisp. I started with barely a week to go before the party. I was making the Merida and Queen Elinor costumes from scratch and crafting accessories so I had a lot of work to do. I had ordered stretch panne velvet fabric in teal and sage from Fabric.com which had the perfect texture as well as being very easy to work with. I started on the Queen Elinor dress basing it on an easy medieval pattern with only side seams that I adjusted by adding in the split in the skirt and extending the sleeves. I first made a mock up using a bedsheet to check fit before I cut my nice fabric and sewed the actual dress on my machine. The dark green fabric was a pair of sweatpants that I cut up and added in. The gold braid for the neckline was from a past project. I added embroidery especially around the sleeves to add in gold around the edges. The crown was made of gold glittery craft foam with a puffy painted jewel. The belt was made of thin wooden disks covered in the gold craft foam. I punched holes in them with an awl so I could link the disks with jewelry chain. The center hollow circle was the inner loop from a small embroidery hoop that was spray painted gold. The dangling circles were made from gold floral wire from Dollar Tree, superglued to secure them, and linked with more of the jewelry rings. To make the belt fit, I added a chain section since there was not enough room for another circle. My mom had a dark green turtleneck in her closet that she wore under the overdress to complete her outfit. Sunshine’s Merida costume was designed as a shoulder guard with an attached skirt to make it easy to put on and take off. Because I am stubborn, I didn’t spend the small amount to buy a pattern for a shoulder guard instead making it up as I went. Thankfully I did another mock up, and It turned out really well. I sewed a nylon strap onto the shoulder guard and included a parachute buckle to fasten under her belly. I also sewed in velcro along the length of the edge of the shoulder guard and the opposite side of the velcro along the front of the skirt to attach the two securely. Once I sewed in the lace that I cut off of a table runner I found around the neckline, her dress was good to go. I had to make and attach her bow, quiver, and arrows still. I bought an inexpensive belt at Walmart in the largest size and braided a yarn “cinch” so that it could be secured all the way around her. I chose the belt because it had two rows of holes punched through it that I used to lace on and attach the bow and quiver. The longbow I already had. The quiver was made of a piece of brown craft foam that was hole punched and laced with faux suede cord. I also puffy painted swirls onto the quiver for decoration. The arrows are wooden dowels with craft foam “fletching” superglued on. The belt stayed secured with items attached without any additional help. For the finishing touch, we braided Sunshine’s mane the day before so that it was nice and curly and wavy. I kept my Will o the Wisp costume minimal because I knew that the other two costume would take time. I bought a blue hoodie from Walmart and spray painted the sleeves, hood, and outer edges of the jacket a darker blue similar to the wisps in the movie. My headpiece is cut and layered blue craft foam superglued onto a spray painted headband. I also spray painted a cloth to cover my lantern. Although it didn’t read as well in the daylight, once it became dim the lantern glowed blue and everyone could follow the light of the wisp. The fabric was the greatest cost although I got a good deal on it and I bought too much so I have some left over for other projects. I also had to buy thread, velcro, nylon strapping, parachute buckle, belt, faux suede lacing, wooden dowels, craft foam in various colors, floral wire, wooden circles, hoodie, spray paint, etc. I cut costs by using a lot of found items from my house and leftovers from previous projects. Based on what I had to buy for these costumes, the Queen Elinor costume cost about $23, the Merida costume cost about $35, and the Will o the Wisp costume cost about $17. I made this for the Halloween costume party at the barn where my mom leases Sunshine. Everyone at the party loved it and my friends on facebook have all really liked the costume. The kids had no problem identifying our characters. How did your horse like it? Sunshine is a fantastic horse. I have worked with her previously and my mom has done a lot of work desensitizing her towards “scary” items and building her bravery. She is also not the slightest bit tail-shy, so I wasn’t worried about draping a skirt completely over her tail. I did a Belle costume last year on a horse who was very tail shy so the skirt was only on top of the hindquarters instead of draping over. However to be sure, we did a dress rehearsal a couple of days before in case we needed to do any additional training with the costume items. Since that was a windy day and she didn’t care at all about the skirt blowing around her I knew she would be fine. Although she didn’t mind it, we didn’t attach the bow for the walk towards the costume area so she wouldn’t have to walk with it swaying because of its length and possibly bang into her side. Even with it attached though, she seemed very comfortable and had no problem grazing or greeting her admirers. Love it, it is so cool! hope you win!